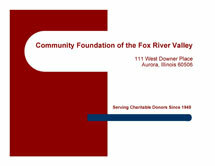 See our Slide Presentation (PDF) with photos of our donors and local non-profit organizations. In this presentation, we explore our past and highlight our present. After viewing, please contact us with your questions or suggestions. We welcome the opportunity to share this information in a PowerPoint format with your service club or community organization. Please contact our office to schedule a time for a presentation.